That would be my vote. I bet it worked too! Hahah! I love the biting. Yan - That does look like a classic vamp pose. Good call! NOM! Definitely biting. At my house, Reba starts out licking another cat's ear and then just follows it up with chomping on said ear. There's always a speeding train of cats dashing down the hall after one another around here. :) Awesome pic! And now after seeing all of those lovey dovey pictures, we see how they really are. Yes, I think Finn is looking to start a kitty rumble. He wants to start trouble I think. Great shot! Either way, Emmy looks totally unfazed... but what happened AFTER the photo was taken?? They are both so, so adorable. Especially Finn. And biting. It's definitely biting. 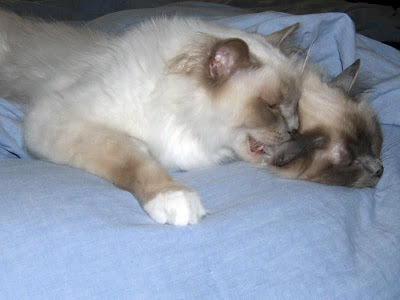 Was he biting the ear or licking the ears, my cats will lay next to each other grooming each other till one gets tired and then they start biting each other. They can be so sweet. There are no cats in my writing (there's a cow, though!) and I am not really a cat-lover, but...even I am totally charmed by that picture. probably the latter! Ahhhh, I just have to have my weekly dose of Emmy & Finn!